I am doing cold ethanol extractions, around 4 to 5 gallons at a time. I have been using a 3L glass distillation setup that works pretty well, but takes a long time, and is easy to over heat towards the end of distillation. It looks like the more expensive one has a bump trap, different seals, and a nicer one piece stand. I see that some have a feed and drain port to help save time removing flasks to load/unload solvent, this seems like a great option to have. I could use some advice on which one to get. I’m not very familiar with them, if you have any input that could save me some hassle, it is much appreciated. Get ahold of lanphan-industries for a quote. Those are universal Chinese rotavaps that all come out of the same plant. I’m actually.in the middle of a run now. Shut down until tomorrow unfortunately. Have tou used there equipment before, i just got there catalog and some quotes but im weary of all the Chinese suppliers. I have all touch science simply because i can see on ig verified users thag have real opinions about there equipment. I need to place a order very soon before the tarrifs take effect. I will see his post. Thanks for letting me know about this company. I ended up going with the RE-501. I got a great deal and shipping was quick too. A 2L one has a standard 24/29 joint on both sides and is easily customizable but the 5L one you’d need to buy an adaptor to reduce it to 24/29. nonetheless I love my 5L rotovap. Having the capacity is great. TerryLu, can you send me a quote for re-501 and appropriate chiller? Hey, I think you gotta DM him and give him your email. I just did the same. What do you mean by that Lanphan = Touch Science? Anyone know if you can use some of the Ai replacement parts for the 50L TS/Lanphan rotovap models? Specifically the PTFE (2 pc) sealing kit for the flask. I have been debating as well between the 501 and the r1005. Eletric lift, bump trap, room to grow? Worth it? 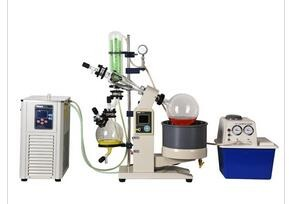 And also what CFM is good enough for a rotovap vacuum? The r1005 does have some nice features. I’m not positive, but i think it has a valve so you can close off vacuum to the collection flask and drain it, while the system stays under vacuum. The 501 does not have this feature, although it’s not that big of a deal to break vac and drain while the main flask is spinning. The electric lift is also a nice feature, the bath looks more stable. The manual lift is easy to use, but the water bath bowl will move around slightly because is lifted by a jack. I did read someone said that the electric lift burned out on them and was difficult to fix, so they advised going with the 501 in the future. The 501 fits nicely on a table and is easy to move around because the water bath is a separate piece. I have a similar chiller that works well with the 5L. I did read the water aspirator pump will lose power if running for a long time. As the water heats up, the aspirator loses ability to pull vacuum. Those welch diaphram pumps rock for rotovap and buchner filtering. I own 3 of them.